We're very excited to introduce this year's Online Semifinals judges. They are evaluating hundreds of video recitations and deciding which 24 students will be invited to compete at this year's National Finals in Toronto. The winners will be announced on Wednesday, March 21. Born in Montreal, Martine Audet is the author of over a dozen poetry books, as well as two children’s books. 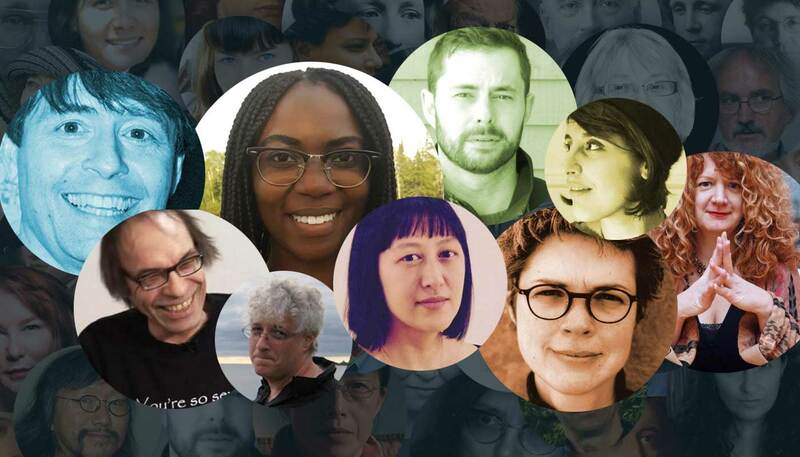 Among other distinctions, Audet has received the Estuaire Magazine Prize, the Alain-Grandbois Prize, and has been shortlisted for the Governor General’s Award and the Grand prix du Festival international de la poésie de Trois-Rivières. Audet occasionally associates painting and photography to her writing. She illustrated L’oiseau, le vieux-port et le charpentier by the late poet Michel Van Schendel. Her most recent poetry book, Ma tête est forte de celle qui danse, was published in 2016. Michael Crummey has published ten books of poetry and fiction. His first novel, River Thieves, was a finalist for the Giller Prize and won the Winterset Award. Galore won the Canadian Authors' Association fiction prize and the Commonwealth Prize (Canada & Caribbean Region). Sweetland was a national bestseller and a finalist for the Governor-General's Award. Little Dogs: New and Selected Poems was published by House of Anansi in the spring of 2016. He lives in St. John's. Tracy Hamon was born in Regina, Saskatchewan. She holds an MA in English from the University of Regina. Her first book of poetry, This Is Not Eden, was released in April of 2005 and was a finalist for two Saskatchewan Book Awards. A portion of Interruptions in Glass won the 2005 City of Regina Writing Award and was shortlisted for two Saskatchewan Book Awards in 2010. Her third collection, Red Curls, won the Drs. Morris and Jacqui Shumiatcher Regina Book Award in 2015. Raised in Trinity Bay, Newfoundland, James Langer is the author of Gun Dogs (House of Anansi), which won The Gerald Lampert Memorial Award for poetry. He co-edited The Breakwater Book of Contemporary Newfoundland Poetry and lives in St. John’s. Actor, poet, and translator Charles Leblanc was born in Montreal in 1950, and moved to St. Boniface (Manitoba) in 1978. He worked as an industrial worker, teacher, and translator; he now hosts a program at the community radio station Envol 91.1 FM. However, theater and literature are at the core of his activities. Over the years, he co-founded six theater companies, was part of the Manitoba Improvisation League and the socially engaged Popular Theater Alliance troupe, and he played at Cercle Molière. Over the years, he has collaborated on a book of epistolary stories and has written nine books of poetry published by Éditions du Blé. He seeks a poetry of the street and of the heart, trenchant, with spectacular madness. He is also secretary-treasurer of the new Association des auteur.e.s du Manitoba français. His latest poetry releases are Soubresauts (2013) and Les lieux de l’amour/l’amour des lieux (2015). Stuart Ross is a writer, editor, writing teacher, and small press activist living in Cobourg, Ontario. He is the award-winning author of 20 books of poetry, fiction, and essays, most recently Pockets (ECW Press, 2017), A Sparrow Came Down Resplendent (Wolsak and Wynn, 2016), and A Hamburger in a Gallery (DC Books, 2015). Stuart has taught workshops in elementary and high schools across the country, and was the 2010 Writer-in-Residence at Queen’s University. Visiting schools and working with students of all ages is his favourite part of his writing practice. Stuart is at work writing nearly a dozen different poetry, non-fiction, and fiction manuscripts. It's a race against time! Chimwemwe Undi is a performance and page poet living and writing as a guest on Treaty One in Winnipeg, Manitoba. Her work has appeared on stages at the Canadian Festival of Spoken Word and the Edinburgh International Book Festival, and in the pages of Room Magazine, Arc Poetry Magazine and CV2, among others. She holds an MA in linguistics from York University. Her debut chapbook, The Habitual Be, was published by University of Nebraska Press in 2017. Phoebe Wang is a poet and educator based in Toronto. Her debut collection of poetry, Admission Requirements, appeared with McClelland & Stewart in Spring 2017. She is the author of two chapbooks and her work has appeared in Arc Poetry, The Globe and Mail, Maisonneuve, Ricepaper Magazine, and THIS Magazine. She has twice been a finalist for the CBC Poetry Prize and won the 2015 Prism International Poetry contest. She currently works at Seneca College and was a co-coordinator for 'Fuel for Fire,' a professional development event for writers of colour in partnership with the Ontario Arts Council.